Long before the Kardashians headed to Miami, the rich and famous flocked to Miami to live. Whether a permanent residence for successful business people, dignitaries and sports icons or vacation homes for some of the world’s favorite celebrities, sightings are commonplace throughout the downtown, beach and island areas. Following are the top Miami neighborhoods where the rich and famous live. 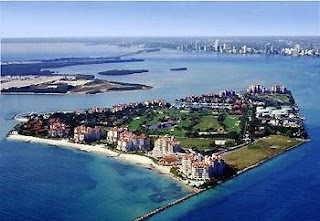 As one of the most exclusive communities in all of Miami, Star Island is a favorite of celebrity residents. 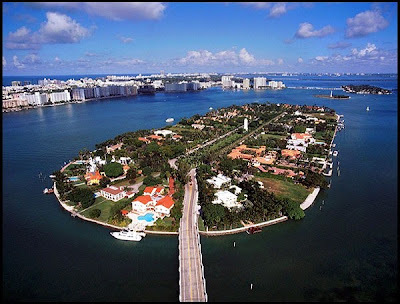 Star Island is a man-made island in Biscayne Bay that, while it has a guard house at the only entrance to the one street neighborhood, is a public neighborhood in which anyone can enter after stopping at the guard gate. On the island are very large estates that are home to many wealthy homeowners including some very famous people. Some names of former and present residents include Julio Iglesias, Rosie O’Donnell, Shaquille O’Neal, Gloria Estefan, and more. List prices for Star Island homes typically start at about $10 million. Over the past five years, one home has sold each year with sale prices and sale prices per square foot varying with no common thread. In a nutshell, potential buyers want to live on Star Island and have no issues paying to live there as they can easily afford it. Palm Island is another manmade island that lies in Biscayne Bay and is accessible by one entrance from the Mac Arthur Causeway. Homes on Palm Island are grand in their appearance and offer the ultimate in luxury living. Homes feature extensive pool and outdoor living areas along with private docks housing mega yachts and multiple vessels. Celebrities who have lived or still own homes on Palm Island include Barbara Walters, Gabrielle Anwar, Al Capone, Enrique Iglesias, Anna Kournikova and others. Palm Island real estate typically ranges between about $4 million and over $20 million. In 2012, two homes sold between $2.8 million and just over $5 million while one home sold earlier this month for $2.4 million. 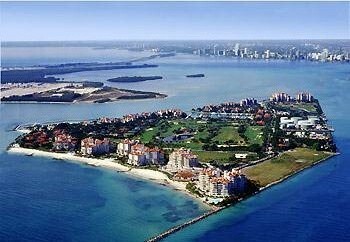 A barrier island in Miami, Fisher Island is known for having the highest per capita income in the United States. 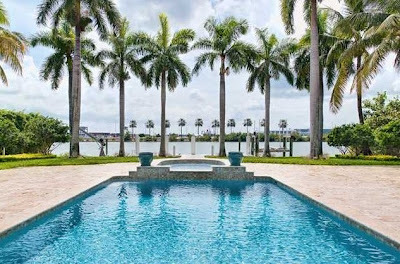 It is one of the most exclusive neighborhoods in all of Miami-Dade County. Fisher Island real estate features some of the most beautiful and sought after condominiums. In addition, the community amenities are second to none with a private marina and yacht club, elegant Club, secluded beach club, and top golf course among other things make it as elite as the residents who choose to have homes on Fisher Island. Some of the celebrities who have lived or still live include Oprah Winfrey, Jim Carrey, Andre Agassi, and others. Fisher Island real estate features condominiums varying in size but offers an immense amount of luxury that is second to none. With list prices from the mid-$200s at Marina Village to $15 million at Oceanside, residents have the ability to live an exclusive lifestyle on Fisher Island. In 2012, 24 units sold with sale prices ranging from $300K to over $5.7 million. So far this year, six units have sold with prices between $500K and over $6 million. Only a very select group of people have the ability to live in the exclusive Miami communities. While there are certain communities where celebrities tend to seek out homes, there are always celebrity spottings throughout Miami. Other areas include Brickell and Miami’s Design District, Key Biscayne where Miami socialites and other celebrities have homes, and of course, Miami Beach/South Beach. Miami has always been a worldwide fashion and cultural mecca in the United States and continues to draw the rich and famous to live in areas all over the city.